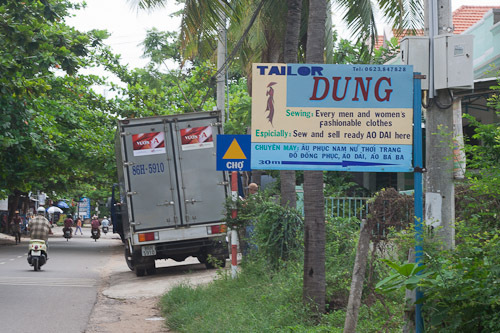 I arrived in Mui Ne yesterday just ahead of a massive thunderstorm which caused a major flood out the front of my hotel. 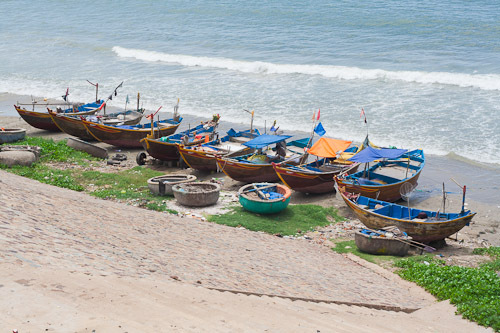 Mui Ne is on the coast about two hundred kilometers north of Ho Chi Minh City. It is a big tourist resort. This is just south of where I am staying and looking north. 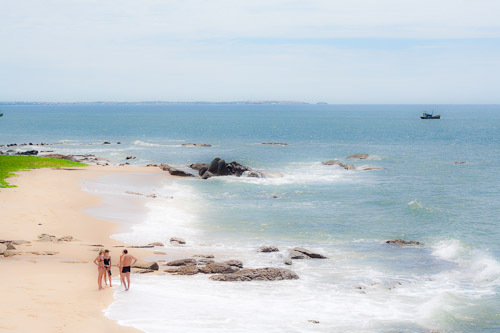 There are not many places to access the beach because all these resorts hog the land next to the beach. 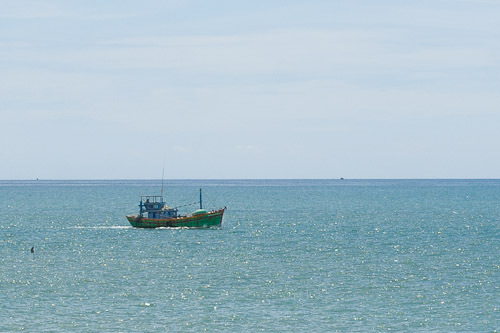 And of course there are the fishing boats. I helped to pull in some nets on the beach this morning but they only caught a piddling amount. About a couple of kilo of tiny fish and a few squid and prawns. Not really worth all that effort in my humble opinion. There are heaps of new resorts going up. I think they are trying to emulate the tackiness of the Gold Coast. 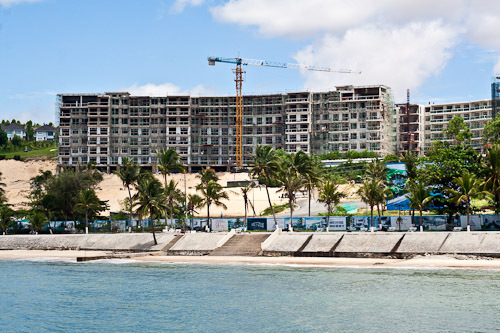 Luckily they did not bring in any Khmer architects to design it or it would have looked ultra hideous. This is rather an unfortunate name or it might mean something. These fishing boats have a really curvy bottom. They get them out of the water by turning the boat around and around until it is up the beach a bit. It is very labour intensive. I used to use my car and a pulley to pull up my dinghy. Too bad I changed about three clutches. 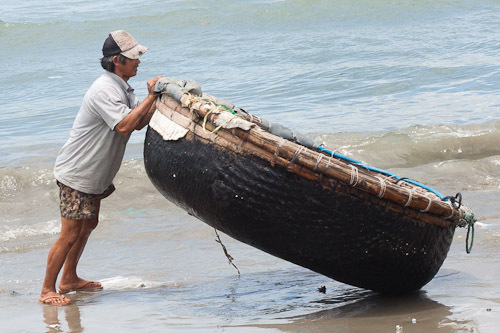 They use these coracles which are made out of bamboo slats and this one is sealed with tar. There are a lot of them that are made out of fiberglass. They use a single oar to scull them around. 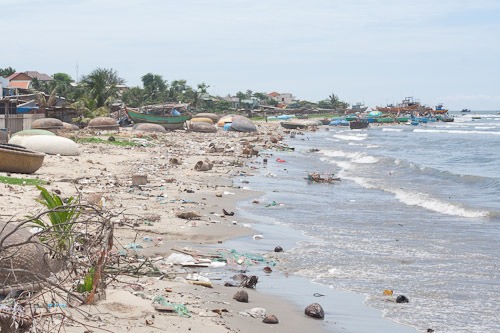 The beaches are absolutely filthy with plastic and all sorts of junk like old nets all twisted together in these ugly mats of garbage. 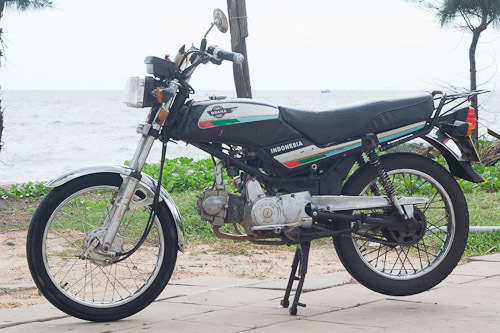 This bike has brought me all the way from Hanoi to within a couple of hundred kilometers from Ho Chi Minh City. My mission is almost complete. It has been a gruelling couple of weeks. The distance from Hanoi to Ho Chi Minh City is about 1700 kilometers but I reckon I have done more than that going up and down the mountains. Tuyen Lam Lake, Dalat, Vietnam. 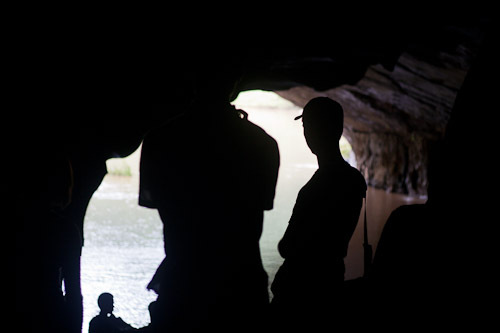 The last blog I posted was from Phong Nha Cave. 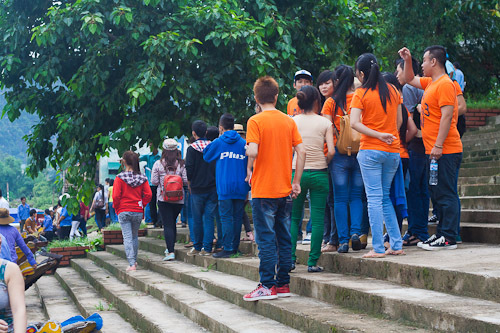 Since then I have been to Hue, then up the mountains to Phuoc Son, Buon Ma Thuot and finally to Dalat. 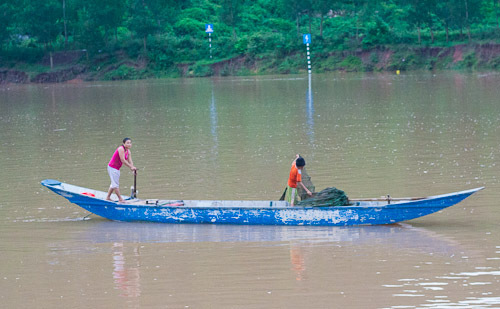 Tuyen Lam Lake is about five kilometers from Dalat. It is surrounded by pine forests. 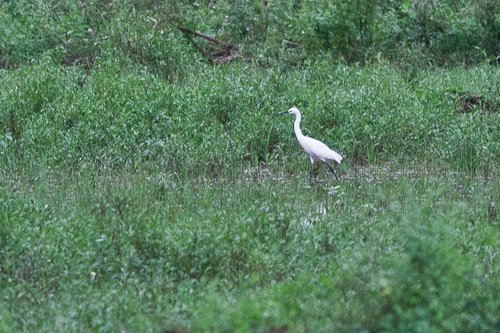 The birding here is quite good and better than any other place I have been to in Vietnam. 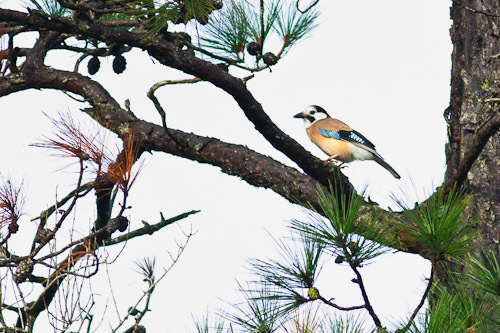 The Eurasian Jay (Garrulus glandarius leucotis), race leucotis, has a black cap and a wide black moustachial band with white sides of the head and throat and buff underparts and back. 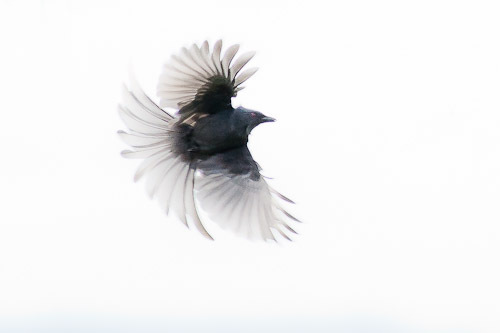 These Black-collared Starling seemed to have a more creamy coloured head than the usual ones which are whiter. It took me a while to identify these because of the different coloured head. 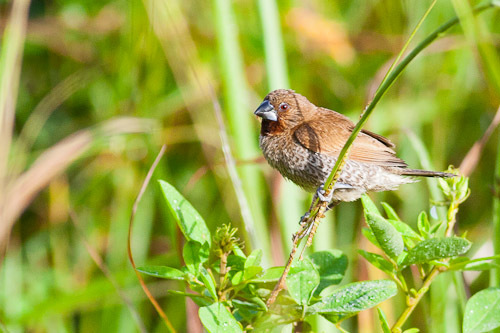 I had not seen any Scaly-breasted Munia for awhile. 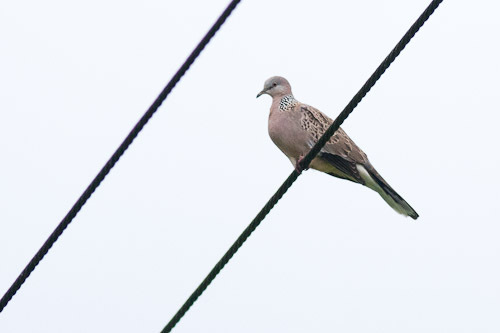 They have been nearly everywhere in South-east Asia. Eating grass seeds is what they do. 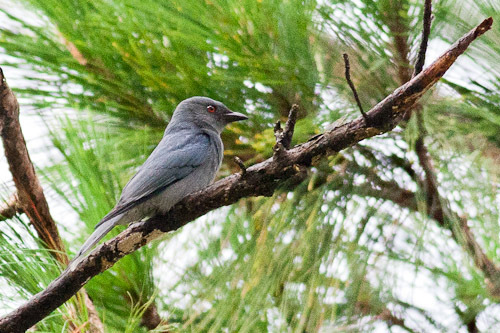 The Ashy Drongos were doing lots of hawking for insects from the pine trees. 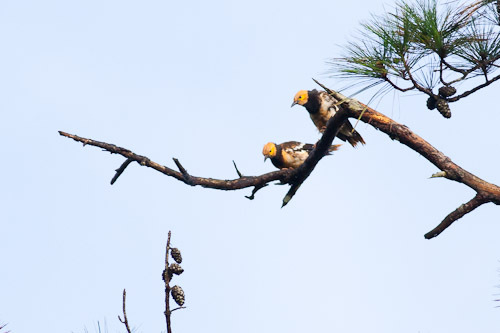 They would fly out, swoop around for a bit and then return to the tree branch. There were heaps of them around. 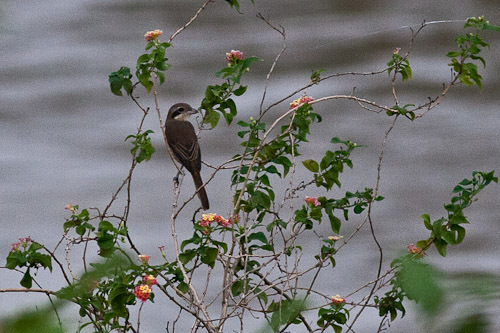 They seemed to be race bondi which range from southern Vietnam, Cambodia possibly Thailand. 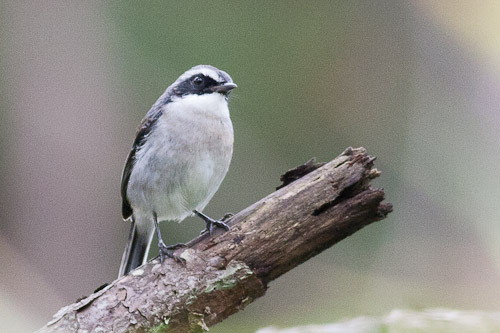 Habitats for Grey Bushchat are subtropical or tropical moist lowland forests and subtropical or tropical moist montane forests. They range from Bangladesh, Bhutan, Cambodia, China, India, Japan, Laos, Myanmar, Nepal, Pakistan, Taiwan, Thailand, and Vietnam. 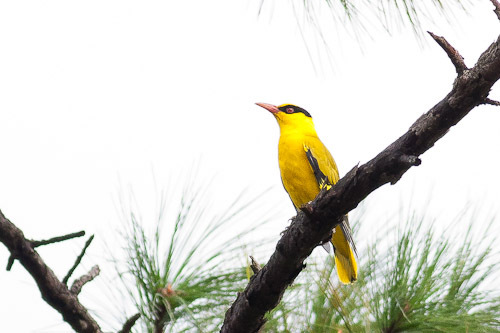 The Slender-billed Oriole has a much finer and thinner bill than the Black-naped Oriole and is the main distinguishing feature (and possibly the only one). 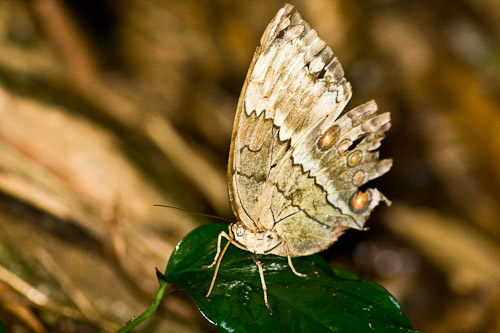 They are found in Bhutan, China, India, Laos, Myanmar, Nepal, Thailand, and Vietnam. 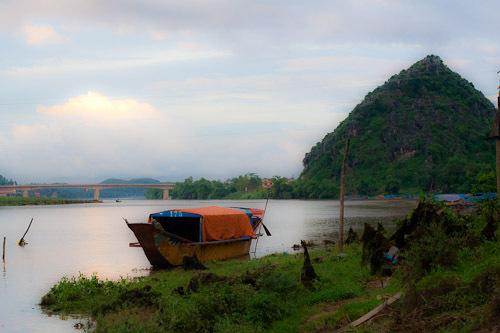 This afternoon I walked along the river towards Phong Nha cave. I left my motor-bike at the new national park headquarters and had a good look at the steep karsts along the river. 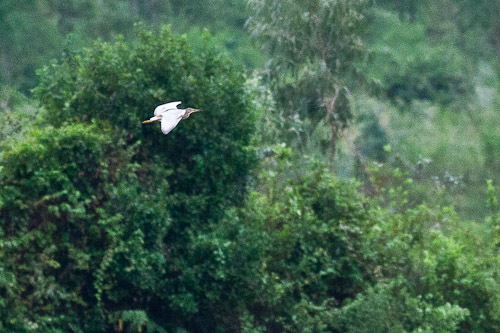 I had seen a few Chinese Pond-heron in the fields and water-ways as I have rode around North Vietnam but this is the first one I have captured in my camera. But it was a bit far away. As usual there were lots of butterflies around. 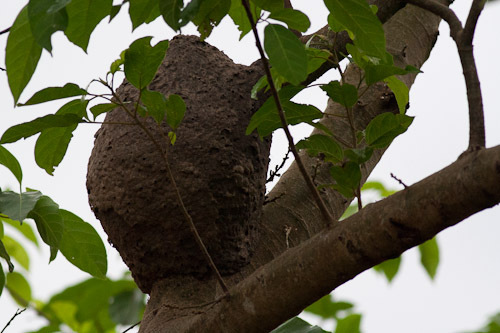 This neat little mud nest was in a tree by the river. 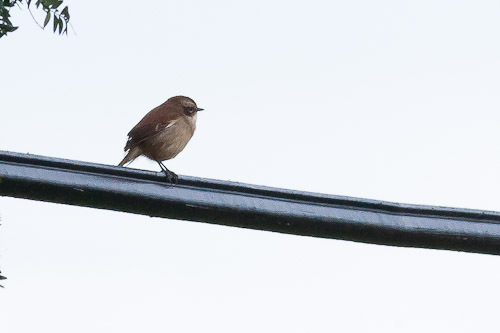 And last of all I just managed to get a picture of this Common Woodshrike before the light went completely. First thing this morning was some noodles – Phong Bo – and a hot black coffee. Then I was ready to go. I headed over to the wharf and there were already bus loads of tourists lining up to get on the boats. Luckily I found some strays to go in the boat with. Weekends in national parks are a no-go area. There are crazy hordes of day-trippers. It is best to avoid and go during the week. I always seem to mis-time my visits to national parks so far. 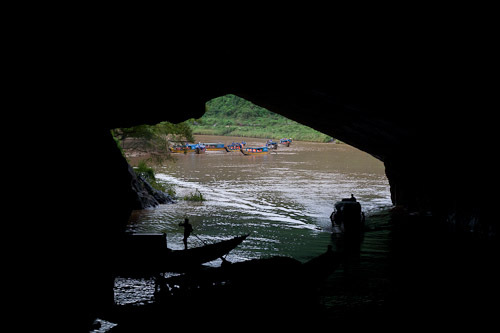 Here we are heading up the river to the caves. They were about a couple of kilometers from the wharf. 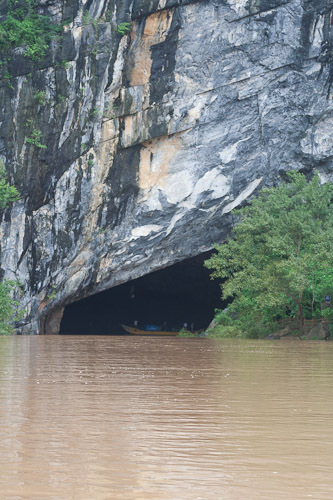 Here is the entrance to the Phong Nha cave. 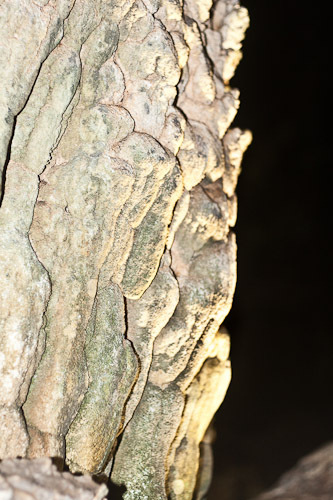 We only went into the beginning of the cave and walked through them because the recent rains means that the river had risen and you would hit your head on stalagtites if you go in the boat through the cave. 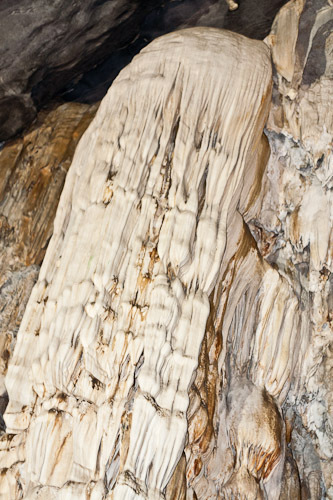 This is looking out from the cave about a hundred meters inside. 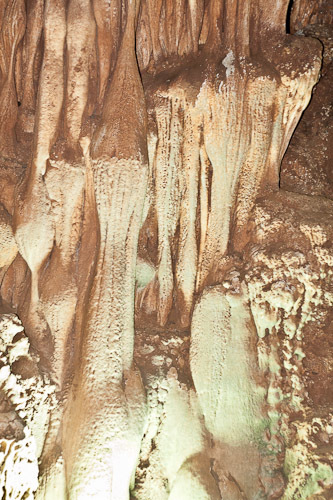 I cannot remember which is which stalagmites, stalagtites. These were a couple of German-Vietnamese guys who were visiting. Their mothers are Vietnamese and their father is German. They can speak Hanoi Viet but cannot understand the local dialect. And coming back out of the cave. We had to bash aside all the local tourists to get out. It was a fight to the death. And here we are coming down the river back to the town and the wharf. I am going to spend the rest of the day sleeping. 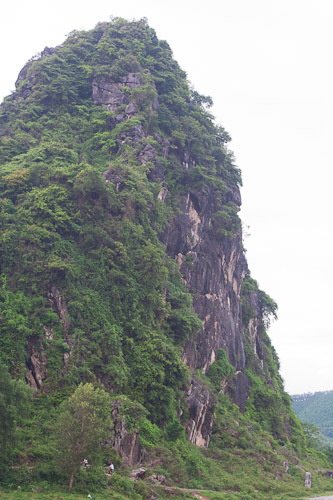 Well I made it to Phong Nha National Park late this afternoon after another dramatic day. Half an hour out of Vinh and the chain comes off the bike. So I wheel it to the bike mechanic (Rua Xe) and he fixes it and sends me on my way. Then about an hour or two later coming down a hill near Pheo on the Ho Chi Minh Highway the chain breaks. So I roll down the mountain and wheel my bike through this village but there is no bike mechanic. So I wheel my bike another kilometer to another village and some guys call me over and offer to fix my bike. They proceeded to fix the chain with a couple of spanners, a file and a hammer. They were fair dinkum bush mechanics. Then I am off again and I stop about an hour later for some lunch and these guys are at this truck stop and have been drinking. One of them tries to ride off on his bike and his mates try and stop him. He gets angry and his mate punches him and wrestles him off the bike. At this stage I escaped before any more fisticuffs took place. 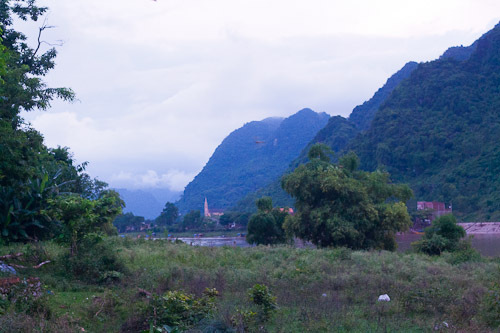 I eventually made it to the town outside of Phong Nha National Park and found myself a hotel with TV and Air-conditioning for nine bucks a night. I think they have wifi downstairs which I will try later after I finish typing. 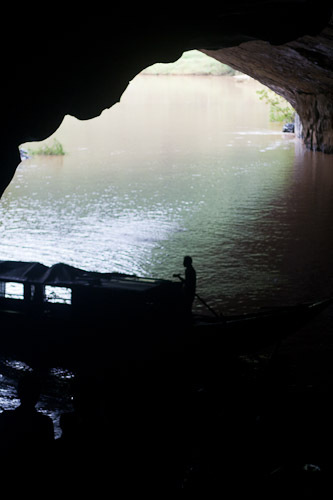 Tomorrow I may go for a boat ride through the cave. 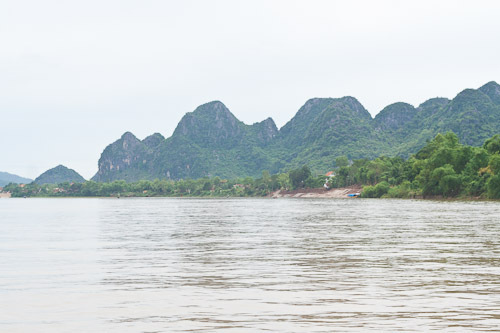 I forgot to mention that I spent four days in Vinh because it was pouring bucket loads of rain every day and I could not get away. There was flooding and torrential rain. It was like a monsoon I reckon. 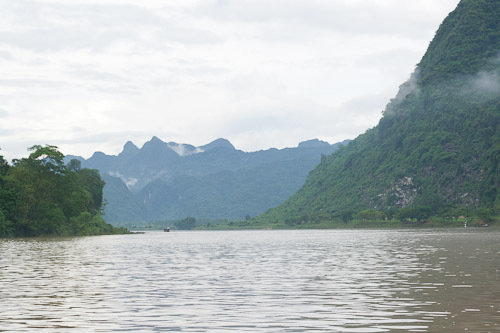 Cuc Phuong National Park, North Vietnam. 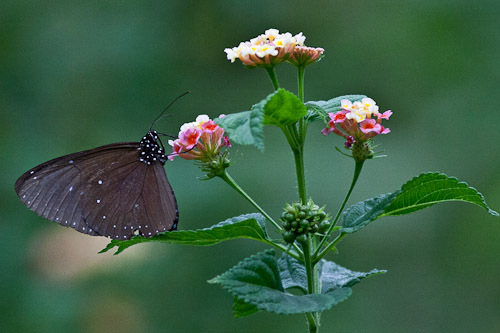 It take me ages to get to Cuc Phuong National Park. I thought I would be there in a couple of hours but it took me like seven or eight hours to get here. The last part when I got off the Ho Chi Minh Highway was horrendous. The dirt road had holes so big that trucks were getting lost in them. 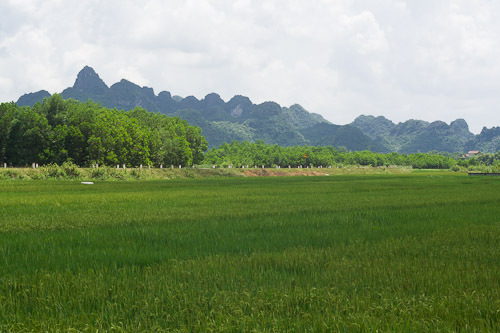 This is the other side of the range of karsts that contains the Cuc Phuong National Park. The park is in a valley between two ranges of karsts. maybe a Grey-hooded Warbler ??? I could not work this one out. 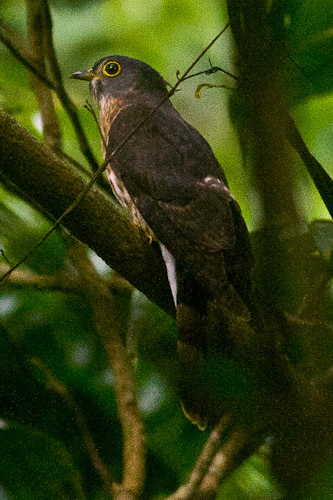 It was mostly yellow with a black stripe through the eye and a rufousish mohawk. 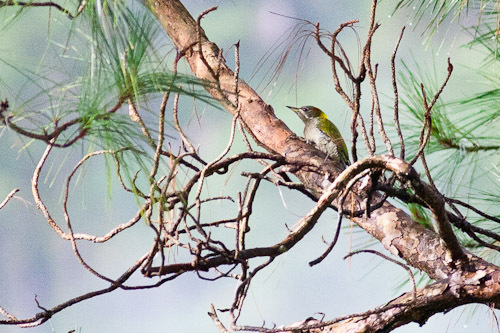 At first I thought it might be a Mountain Tailorbird, juvenile but no it is the wrong shape, the bill is not sharp enough and it is too large. 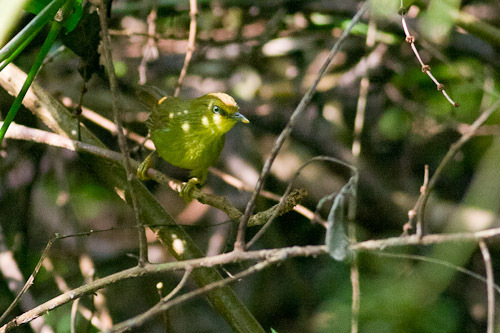 Then I thought it might be a Grey-hooded Warbler but the crown is rufousish. I really am not sure. There were thousands of butterflies around when I rode in to the park, but late in the afternoon I did not see many at all. There were lots and lots of grasshoppers but. 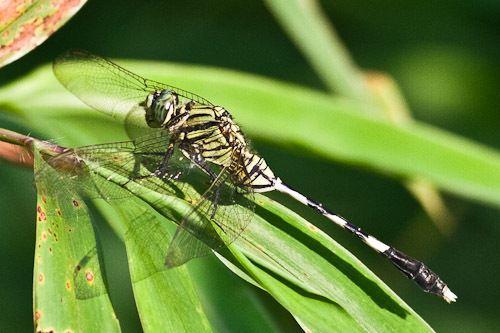 And a few dragonfly. 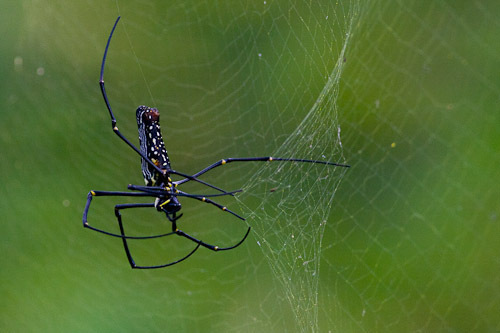 I like this shot of the spider pulling on his web. 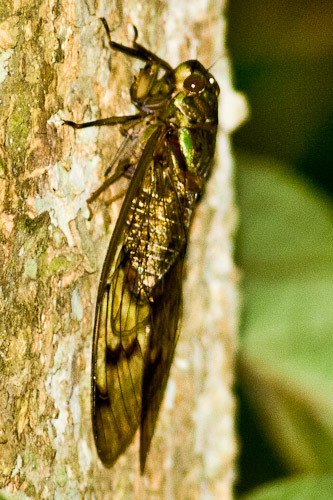 There was heaps of noise in the bush from these cicada-like creatures. I have no idea what they actually are but they sound like cicadas. 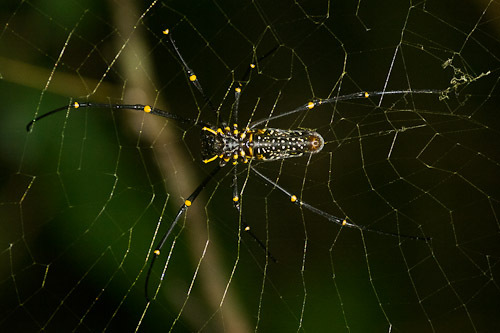 This is the same type of spider as above but the photo is a lot sharper. 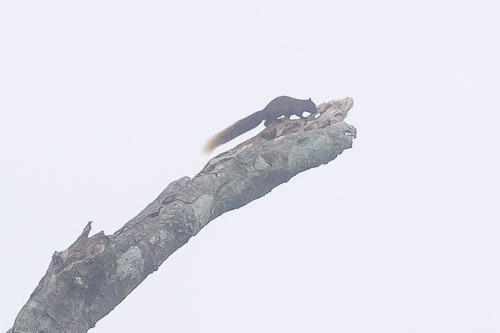 This squirrel ran up this dead tree and disappeared into the end of it. This butterfly was huge, bigger than some birds. He had his proboscis out, eating a big hole out of the leaf. This lizard was on the steps of the track down from the hill where the thousand year old tree is. He stayed there for heaps and was not afraid at all. 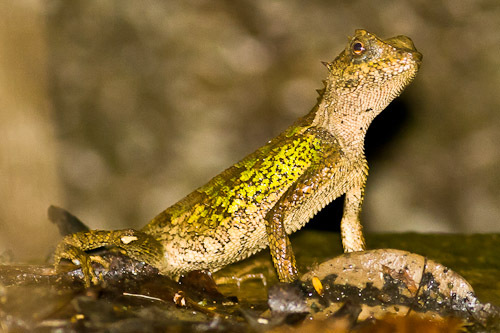 A probable ID for this lizard is Acanthosaura lepidogaster. 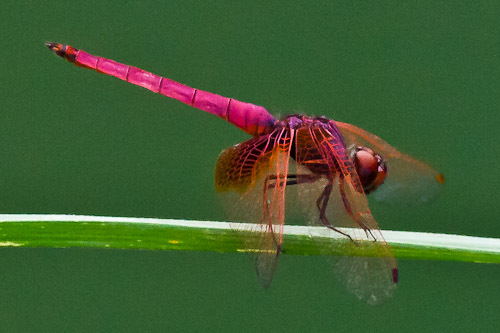 The last morning it was pouring down with rain and I only had about an hour out in the bush and only got this shot of a pink dragonfly that was hanging out at the blue-green algae swimming pool.